As a healer, we priests have always had a lot to track. 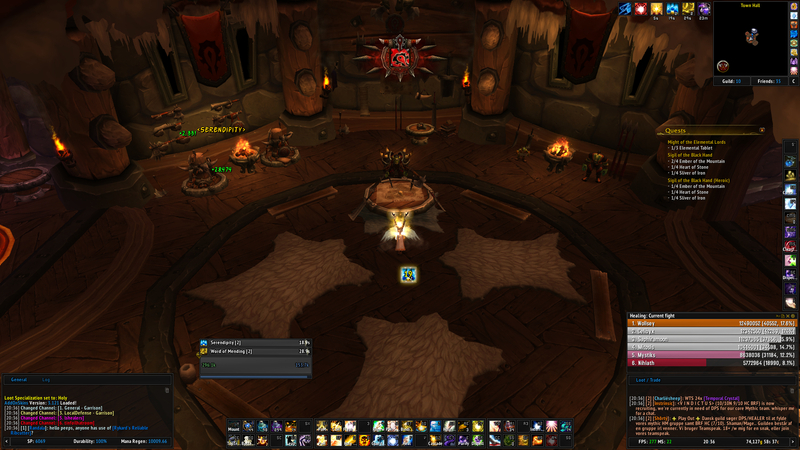 Thankfully various addons have made this ordeal much more manageable. One of the most prominent addons today that helps us track all of our stuff is WeakAuras, a highly configurable addon to show warnings of various nature, be it as sound, visual, or both. The following string is essentially an array of your most important abilities with a cooldown. It's greatly inspired by Derevka's concept, but updated to include, among other things holy words and holy fire. 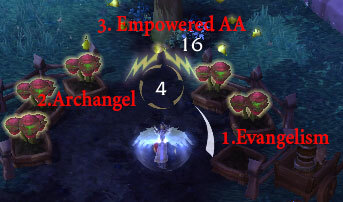 In addition to tracking our cooldowns, we also have a couple of buffs to track eg evangelism for Archangel, or serendipity stacks. It essentially tracks your important buffs and shows stacks where needed and otherwise duration. I welcome others to share theirs or feedback on missing buffs/cooldowns! So i like WA but i dont make WA's lol. I want a WA that tracks my Clarity of Will on my current target and gives me a value of the remaining shield size. Tracking this and pre empting when it was going to fall off the tank made for much better times. I'm having a hell of a time getting this to work properly. This is for WA2 that is downloadable off curse, correct? I'd love to have this interface and get rid of my ForteX bar as it's quite difficult to read at times when they all stack up. I'll see if I can grab Brew's attention for ya! My CoW weakaura is for WA2. I assume Espiee's is aswell. I use elvui and for me they display the cds in a way very similar to Espiees auras. Does it show you an error or they just dont show up? I personally prefer progress bars for CD's but I do have some spells as icons. I have a Spirit Shell icon group that shows when its ready, how long the buff is active (how long you can create shields) and when it's about to come off CD. So I was wondering if anyone can share their VuhDo profiles for disc priest? I use Clique for binding, so I only need frames themselves. I really like default blizzard raid frames for healing, as they are the most versatile and require the least amount of customization. It works great for most of healers, but I feel that I need to see advanced stuff to get the most out of my discipline priest. In my experience, VuhDo works best for this, because it can track in a convenient way the amount of absorption that you stacked on all raid members, including in relation to maximum. I.e. with VuhDo I can see that I fully stacked Spirit Shell on one raid group, and can start stacking it on the second group. Divine Aegis used to have a cap of 40% (I think?) of priest's health, and VuhDo can track that too, as well as the remaining absorption points on PW:S.
However, my customized profiles with VuhDo are long lost, and sweet Jesus H. Christ it takes a lot of time and effort to customize VuhDo, that's the worst part - it doesn't work out of the box. Installing unix is probably easier. I can share my profile if you'll explain what exactly do you need - VuhDo lua file from WTF? I have it fully customized, track mine and other discs PW:S and Weakened Soul, PoM, CoW with the absorb number, other healers HoTs, tanks CDs, raid CDs, other players personal damage mitigation abilities. All of that is in different bouquets. I really love the layouts from the op, but I was wondering why you didn't also include Archangel into the buff layout. It would be awesome to have an icon for it right next to the Evangelism tracker. Knowing if it's on cooldown or when it's up etc. Sounds like an easy addition, but I have yet to get it to work. Fairly new to WA sadly. It's all there, really. The problem was, that for loading criteria, the check box for talent chosen was selected (without specifying one - since there is none for AA, Penance and some other cases). After un-checking it's working like a charm. I don't know if a lot of people here use Tellmewhen but I've made a nice setup for CoP/Insanity DoTweaving for shadow priests. I'm still making some final tweeks but basicly it shows you what to cast and when to cast it. I will post the string here if anyone is interested. The WA from the first post isn't working properly because in a lot of spells the "talent selected" option is marked on the load conditions, which is making them not to load at all. I've fixed this, below is a new string to it. Also, I've made the icons appear from left to right, but this can be changed easly on "Display". Thanks for that! It took me a while to figure out what you meant about the growth (and it's under group, not display - at least for me) but overall it's working like a charm and less work for me. Which comes in handy, since my whole saved data from WA died with a crash today. €: I was toying around with Solace today and if you select it (i.e. skill into it), you'll get displays for both Holy Fire (its icon is changed to Solace but it doesn't work, it simply sits there as ready) and Solace. I have no idea how to fix this, since there is no option to not load something when a specific talent is chosen. Any ideas? Indeed, it was on Group, my bad. I'm glad it helped! For the Holy Fire problem, see if this works. I tried here and worked, but sometimes it bugged. That is so cool-looking holy crap. Totally using this. That works like a charm. Thank you very much, good Sir! I'm back with the TMW string for Shadow Priest DoTweaving playstyle. Note that this sring does not work in Weak Aura's, it is made with a similar addon called TellMeWhen. I would love any feedback from anyone that uses this. Does anyone have a WA for tracking Word of Mending stacks? I'd just be looking for the icon with a number in the center for number of stacks similar to http://i.imgur.com/yBtnjXS.jpg for tracking Serendipity. Need help in figuring out what I did wrong. I was able to make my own WA's for the holy changes in 7.0 (and say a tearful goodbye to my sweet disc ones). All had separate sound triggers; I grouped them for ease of use. Now, whenever I zone into a new area, the sounds go off, but they never play when the spell is off cooldown. Did I do something wrong in grouping them AFTER I crated them? I checked each one by one - and "play sound" is still enabled, as well as enabled on the group button, but I don't hear anything. Does someone have a WA profile for Holy Priest for Legion? I have found it for other classes but found nothing for Holy Priest.